We have had ( as of 6 am) 4.2″ of rain since Saturday night and a little over 5″ in the past week. It is wet. 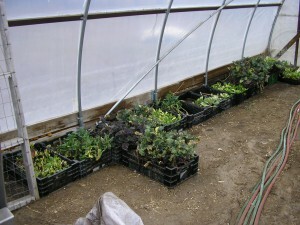 We did get about 900 kale and cabbage plants set out while the weather was nice last week. 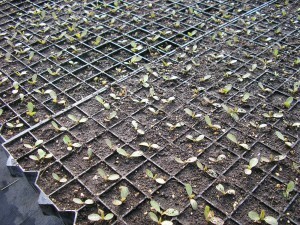 I seeded a few rows or radishes and arugula too. This is $276 worth of squash, broccoli, and cabbage seed. 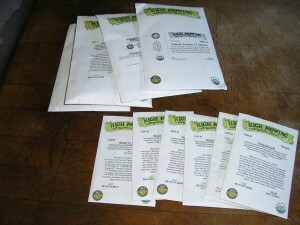 There are a total of 4000 seeds in those packets. 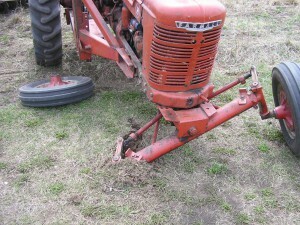 progress came to a rather sudden halt when I drove through a dead furrow while turning around and snapped the the spindle off on the right front wheel. 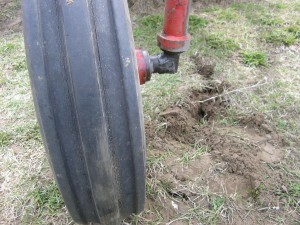 Here is another view where you can see the dead furrow and the grain drill behind the tractor. 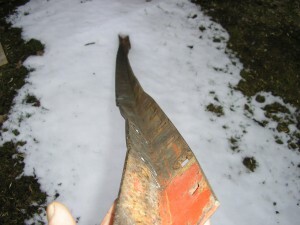 I had broken the spindle on the other side about 15 years ago trying to pull out a dead apple tree. At that time our neighbor Marty welded it up and I put it back on. After that I had bought a spare spindle just in case the weld didn’t hold. The welded spindle is fine to this day. 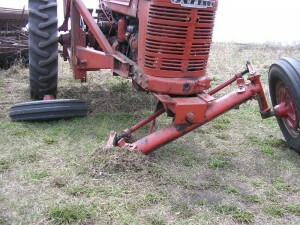 The spare does not look a well made as the original, but the tractor was fixed and moving again in about an hour. I did not get the peas finished, but did get them planted in what would be the wettest part of the field. Now if it dries up even a little I can plant the rest of the peas and not get stuck or make a mess. 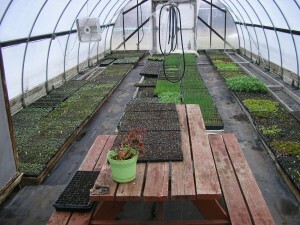 Hopefully the weather will dry out at the end of the week and we get back to planting. There is a hearing tomorrow morning in the House Commerce and Consumer Protection Committee on House File 3140, the GMO labeling law. It is an informational hearing that sets the stage for trying to pass the bill next year. Please contact the committee and thank them for holding this hearing. If one of your representatives is on the committee, all the better. It won’t hurt to add a brief statement why you think Genetically Modified ‘food’ should be labeled. Be polite and to the point, we want them to help us. I was surprised by the warm reception I got from our Republican state Senator when I talked to him about the bill when it was being introduced. Accurate labels are important if we are going make good decisions about what we are eating. A link to the Commerce Committee is below. GMOs are wrong on so many levels it is hard to know where to start. Not labeling GMOs in our food has got to be the dumbest thing that humans have ever done. Hey, I have a great idea. Lets introduce a novel protein in our food, something that no food has ever had. Now, lets feed that ‘food’ to everyone and see what happens. Genius. What could go wrong ? If you are over 50, you probably remember pizza mix in a box. Do you remember anyone who was allergic to milk, soy, wheat, etc. when you were a kid ? My brother had hay fever (asthma) and maybe one kid in grade school couldn’t eat shellfish, but me being a clueless kid, he might have been Jewish. Food allergies in children have increased 50% since 1997. GMO crops were introduced in 1996. England kept GMOs out until 1999. Food allergies increased by 50% in one year after their introduction. It’s not like there was a breakthrough in detection methods that year. What changed in their diet ? But the big chemical companies that control our food supply say that GMO crops are safe. And profitable. I don’t understand why I have never seen one long term study that investigated the result of feeding GMOs and said they were safe to eat. If they exist, wouldn’t they be plastered all over the internet ? Lets not review the Monsanto people nor the revolving door process that lead to the approval of GMO crops. You know, it is looks like corn or soybeans, it is perfectly safe to eat. Michael Taylor says it is so. It is more than interesting that every bag of GMO seed has a contract on it that says you can not use this seed for any research without permission. Clearly no permission has been granted since no food safety research has been done with these seeds. Why is that ? Is there something they don’t want us to know ? Those sneaky Europeans have repeated Monsanto’s GMO feeding study (no doubt without permission) with the same number and type of rats. Except that the European study ran for two years instead of just 90 days The rats developed all manner of horrible tumors and basically died like flies. For some pretty flimsy reasons, the journal that published the paper retracted it after publication. They didn’t say the results were incorrect or the method was bad. I’m sure the board member from Monsanto had nothing to do with it. Just a coincidence to be sure. GMO crops don’t come with little rain jackets to protect them from RoundUp, they absorb it just like the weeds. Once they take it in, they metabolize some of it into aminomethylphosphonic acid (AMTA), but they really can’t do anything with glyphosate or AMTA. At harvest the plants contain both RoundUp / glyphosate and AMTA. Both are toxic. Remember the story in the news for a day last week about Argentina where cancers in agricultural workers increased by 90% and their children are 4 times more likely to be born with birth defects in the last 15 years since industrial agriculture and GMO crops have moved into the area ? Or was it about the chronic kidney disease that is killing droves of farm workers in El Salvador, Sri Lanka, India, all places with widespread glyphosate (RoundUp) and 2,4-d use ? Toxic. The chemical companies say that these chemicals are absolutely profitable safe. And who would doubt that the have our best interests at heart ? On another level, GMO crops are such an abject failure that the chemical companies are having to reconfigure their genetically engineered crops to be resistant to even more toxic chemicals. Weeds have become resistant to RoundUp (glyphostae) and those oh so clean soybean fields were the reason that farmers adopted GMO crops so quickly. The neighbors will talk if you have weeds in your beans. Being the brilliant, far sighted thinkers that they are, folks at the big chemical corporations that control our food supply didn’t realize that weeds would become resistant to years of repeated application of the same herbicide. Weeds have been developing resistance to chemicals since the introduction of herbicides. The claim that GMO crops would reduce the use of chemicals has been proven to be so much corporate BS. But hey, they say it is safe. Now they want to add 2,4-d and Dicamba resistance to GMO crops to deal with the weeds that are resistant to RoundUp. Another master stroke. THAT will solve the problem once and for all. Except maybe for the weeds that are already resistant to 2,4-d and Dicamba. And since the crops will look just like corn and soybeans, the FDA and USDA will decide that they are perfectly safe to eat and will not require any long term safety studies. This is profitable safe too. Remember the little rain coats that the plants don’t get to protect them from RoundUp and how they absorb the chemicals ? 2,4-d and Dicamba are much more toxic than glyphosate. We will be eating those too. “Who eats a mostly organic diet ?” Usually one girl raises her hand. “Who eats Genetically Modified foods ?” Only the same girl ever raises her hand. That is usually met with blank looks. I explain that 80+% of all the ‘conventional’ corn and soybeans in the American diet are the product of genetic engineering. This appears to be new information for these people. We are unwittingly taking part in an uncontrolled pesticide feeding experiment. There are no controls. And when something goes horribly wrong, there is no accountability. There is no option to opt out, people don’t even know they are participating. You should know what endocrine disrupters are. If you don’t, fire up the google and search for ‘warren porter endocrine disrupter’. Should pregnant women be eating foods containing endocrine disrupters, i.e glyphosate ? Who doesn’t want some bizarre chemical affecting hormone levels for a developing baby ? What could go wrong ? Why not let people know what they are eating and let the marketplace decide if these are good things ? Isn’t that the way the free market works ? The answer is, obviously, that corporate profits would suffer. Corporations are people now and money is not property, it is speech, So big chemical companies have a much louder voice than the 90% of flesh and blood Americans who think that GMOs should be labeled. Don’t worry about the farmers, They will happily buy cheaper seeds and grow what ever the market demands. GMO crops feed the world’s cattle. The world’s poor feed themselves. Really. Ask to see the data when confronted with what sounds like corporate BS. It usually is. Remember, ‘Figures don’t lie, but liars can figure’. I have enough risky things to deal with. Eating novel proteins along with endocrine disrupting and toxic chemicals is one risk that I and everyone else would surely choose to avoid if they knew about it. If GMOs were as wonderful as the chemical companies make them sound, cereal packages would have “NOW WITH MORE GMOs” plastered all over the front, but they don’t. We have a Right to Know what we are eating. Just Label It. 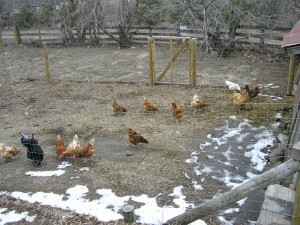 The snow has mostly melted and the chickens are outside again. 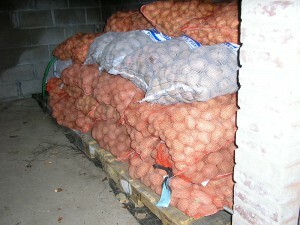 Seed potatoes have arrived and are in the root cellar. 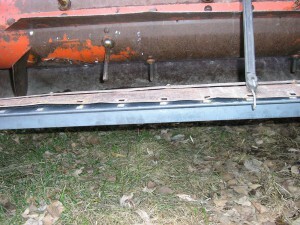 frame parts that were bent when the bean lifters dug in last fall. The greenhouse is filling up. The fields are not turning green yet. 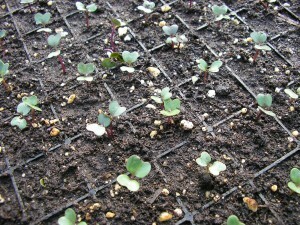 Biennial brassicas are reviving after a long cold winter in the root cellar. 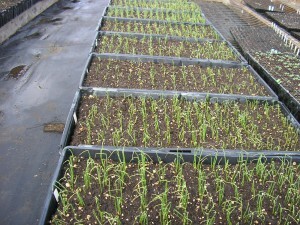 These will be set out and allowed to produce seed. There are 2 kinds of radish, 2 turnips, 3 cabbage varieties, 4 kale, and several types of onions (that are not in the picture). It’s spring. The snow is melting even if it is not exactly warm outside. 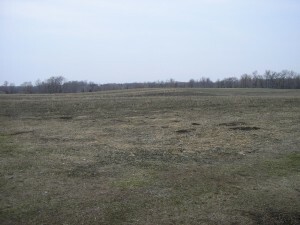 The fields where we will be working are largely clear. A flock of 30 or so robins stops by in the evening and searches for bugs in the flower gardens. The puddles are draining so I think the frost is starting to go out. I was planning to change the greenhouse heater last Saturday. The forecast was for it to be above freezing overnight so it there was a hold up, it would not be a disaster. Saturday morning the old heater was kaput. Gas valves don’t seem to like the heat and humidity in the greenhouse. The hardest part was moving the old heater. 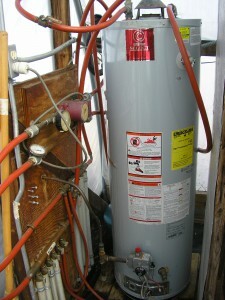 It was full of antifreeze and had been kind of built into the corner behind the germ chamber. Once it was out of the way I used air pressure and a hose to transfer the antifreeze to the new heater. By Saturday night it was up and running. It is nice to have a working pilot light system again and a burner that puts out the rated amount of heat. It has been a little cool in the greenhouse with the fading heater so the early tomatoes, peppers, and eggplant (for plant sales) are a little slow, but the cool season crops have been loving it.